Writes Marcie Cruz, "Just thought that I would let you know that Gerald Cruz, Sr. The original owner of Humps in the Square, also helped A Train, Kix Brooks and the late Johnny "Slim" Campbell get their start has died. Gerald Cruz, Sr. passed away tonight Tuesday, September 30, about 7 pm in Ft. Worth, Texas, with his family and friends beside him. He loved bringing blues and jazz to Shreveport in the late 70's like Roosevelt Sykes, Room Full of Blues, The Fabulous Thunderbirds, Delbert McClenton and so many others. It was probably one of the happiest times in his life." Thanks to Marcie Cruz, too, for the historic photo above and several more from the 70's. JT Nesbitt is a wild man born and raised in Shreveport but come of age amidst the sweet olive trees of the Vieux Carre of New Orleans. He is a capable painter and a designer par excellence. Yet I think I'd have to state his occupation as conjurer. The floods of Katrina upended a world of success for Nesbitt that was wrapped around the Confederate Motor Company and a magical-looking motorcycle called the Wraith. In the salty aftermath he founded BIenvillestudios.com. Ostensibly a cycle design shop, it found its life with a big Lincoln sedan salvaged from the flood. An idea developed: make it into a hot rod capable of making a land speed record run. 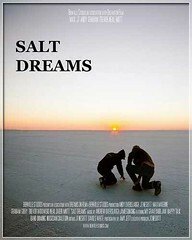 Take it to the legendary salt flats of Bonneville, Utah. Make a film of the process. Nesbitt is handsome, persuasive and possessed of a contrarian drive stick. Hunter S Thompson somehow comes to mind. Those of us who've followed his drama to this point cannot wait to see this entertainment. Thus David Nelson announces that minicine? will host the Shreveport premiere of the documentary "Salt Dreams" and a live performance by My Graveyard Jaw on Wed Oct. 1, 8PM at the Actors Cafe, 1401 Fairfield Avenue. The tariff of $5 is nothing compared to the adventure to be consumed. From the offical press release: "Salt Dreams", by Shreveport native J.T. Nesbitt, documents a group of New Orleans friends, who transform a Katrina-flooded, completely destroyed Lincoln Mark VIII into a high performance speed machine and drive it to the Bonneville Salt Flats, Utah, to set a land speed record. The film chronicles the group's refusal to be defeated by the tragedy of Hurricane Katrina and their attempt to propel themselves into a positive future. 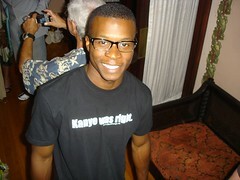 J.T.Nesbitt, the entire "New Orleans Race Team" and the race car will be present at the screening. 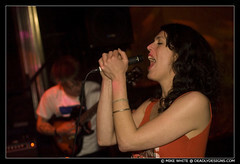 Live music following the film will be provided by the New Orleans band, My Graveyard Jaw, featuring Stix du Clown. Imagine a top-hatted unicyclist in the traffic alongside the Citroens of Paris. Under his black stovepipe he wears black turtleneck, black bell-bottoms and black ballet flats. Over his should is a stiff coil of rope. If you were in Paris in the romantic late 60’s you were catching a glimpse of Philippe Petit, a gifted young magician, mime, pickpocket and wire walker. Though he became a star performer in Paris, Petit’s ambition lay far beyond his home. Being constructed in NYC was a stunning project called the World Trade Center. Petit felt that the WTC would be the ultimate challenge for his unusual skills in wire-walking. The movie Man On Wire is the 90-minute story of Petit’s struggle to build a team among his freewheeling peers and stage their illegal assault upon the WTC. It is a well-paced and absorbing movie. Petit, well-preserved and vibrant at age 58, tells the story. He has the footage from France in the 70’s when his conspiracy was set in motion. It is almost a movie for all ages. There is one quasi-comic but adult scene in which the hero pauses to enjoy one of his many female admirers after his triumph at the WTC. Man On Wire is a stimulating interchange with a gifted and marvelously wacky fellow. I recommend it wholeheartedly. 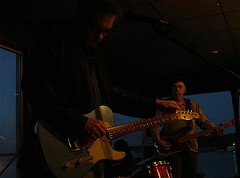 Kevin Gordon, guitar, vocals and melodies, and Paul Griffith, drums and background vocals, will anchor against the tides of Cross lake tonight at Jayne Marie. There will be a bassist, too, and it will be a comfortable evening. Griffith is a Centenary grad who, after his years as A Train drummer, made it to Nashville. His podnuh, Mister Gordon, seems to have excaped to Nashville from Monroe. Griffith's droll blog is at myspace under griftco. Kevin Gordon, equally wry ("God don't ever change") is also on myspace. 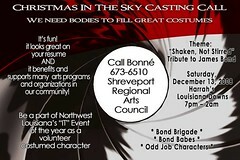 James Bond is the esteemed host of the 2008 l'affaire d'enfer called Christmas in the Sky. The Night of Cleavage, as it is affectionately referred to by seamstresses across the city, needs costumed bodies as a backdrop for the guests' be-costumed bodies. Sky artists have been at work on the designs. Soon they will need the models, says Bonne' Summers. The cast call will be viewed at Harrah's La Downs - site of XiS - on Sat, Dec 13, all evening: 7 pm to 2 am. In the meantime you may chase a spot in the chorus by ringing Summers at 673-6510. The Highland community's wide streets, bicycle lanes, and affordable historic homes make it popular with the jewelry makers, painters, and sculptors who have lived here for years. Many of the houses have detached garages so there's plenty of space for creativity. Shreveport became Louisiana's movie capital after Hurricane Katrina hit in 2005, and actors, directors, and other industry types have found temporary lodging in Highland, which has also served as a backdrop for some feature films. 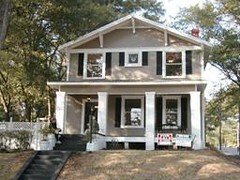 Nice three-bedroom homes are available for $100,000 or less. They mis-read her on bike lanes and the first illustration BusinessWeek ran was of Highland in Los Angeles. But the main is solid. 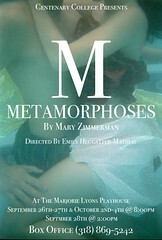 Based on Ovid's transformation myths, Metamorphoses, by Mary Zimmerman, subtly mixes the ancient stories of pathos and tragedy with contemporary language, humor, and thought, all enacted in and around a large pool of water in the center of the stage. The themes of love, the inevitability of change, and the human ability to adapt to change are timeless, as is amply demonstrated by the sometimes eerie closeness of a vignette to the original lines from Ovid, which still manage to resonate with modern viewers, says Library Journal. The college's most fluent players anchor the cast: Lorna Dopson, Nate Wasson, Destin Bass. Professor Don Hooper designed the pool. Box Office opens Fri, Sept 19, and will be open daily between the hours of 12 and 4 pm. Call 318-869-5242 for info. 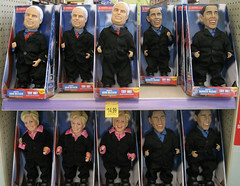 Have you thought about who you'll be voting for in the October 4th primary election? So asks Centenary student reporter Nadine Kaskas. On Tues, Sept 30 at 11 am, College Democrats will present an informal meet and greet with Democratic Congressional candidates Paul Carmouche, John Milkovich, Dr. Artis Cash, and Colonel Willie Banks in the Student Union Building. Pizza will be provided so make sure to drop by the SUB at 11 am-12:15 pm on Tues, exhorts Kaskas. Animatronic dolls photo Scott Beale / Laughing Squid at laughingsquid.com. Southern Black Theater Festival event! Featuring: stage reading, monologue, storytelling by Joanna Ballard and of course POETS! The Rick Willis Benefit is a musical extravaganza at Lee's Place on Tues, Sept 23 at 7 pm, says Blue Martin. The suggested cover charge is a donation of $10, with all proceeds going to local musician Rick Willis to help with the costs incurred after a serious injury, surgery and several weeks in the hospital. Orchestra Players United of Shreveport and the Symphony Orchestra of Shreveport-Bossier Audience Association will present a concert to benefit musicians and hurricane relief in Northwest Louisiana, says Susan Rogers. The concert will take place on Sat, Oct 11, in the First Baptist Church of Shreveport - at 7:30 pm. 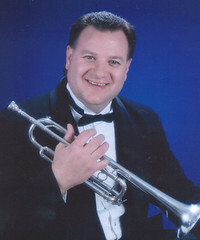 Featured along with a full symphony orchestra will be trumpet soloist Rick Rowell in a program including Verdi’s Nabucco Overture, the Arutiunian Trumpet Concerto and Dvorak’s New World Symphony. The program will be conducted by Kermit Poling. Legendary drummer Earl Palmer died at his home in Los Angeles Friday after a lengthy illness, writes Bruce Flett. Inducted into the Rock n Roll Hall of Fame in 2000, the first year for the category "Sideman," Palmer was the session drummer whose pioneering backbeats helped define Rock and Roll. He moved to Hollywood in 1957. He played on sessions from the Monkees to Frank Sinatra. Born in New Orleans October 25, 1924, he was the drummer at Cosimo Matassa's legendary J&M Studio on Rampart and Dumaine in the 1950s. Fats Domino, Little Richard and many others had million sellion singles with Earl on the drums. He was on the drum kit in 1949 when "The Fat Man" was recorded there. It was Fat's first hit and a contender for the first Rock n Roll record ever. His playing on that song featured the back beat that has come to be the most important element in rock and roll. 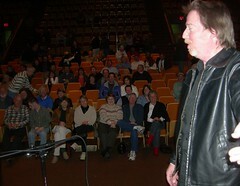 Palmer said, "That song required a strong afterbeat throughout the whole piece. With Dixieland you had a strong afterbeat only after you got to the shout last chorus. . . . 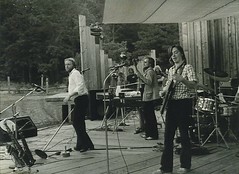 It was sort of a new approach to rhythm music." When Shreveport's "A" Train band first got booked at the Los Angeles Street Scene festival in 1983, one of the first persons they contacted was Earl Palmer for his assistance and guidance. The "Live at Humpfrees" LP had just been released and he was sent a copy. He told bandleader Bruce Flett he thought it was "very exciting", and steered him to Columbia A&R head Bobby Colomby (former drummer w/ Blood Sweat & Tears) for consideration. Bobby, evidently not so excited, never replied. Palmer famously said, "You could always tell a New Orleans drummer the minute you heard him play his bass drum because he'd have that parade beat connotation." Listen to John Bonham's drum intro on Zeppelin's "Rock n Roll". It's Earl Palmer's drum intro on "Keep a Knockin'" by Little Richard. Shreveport's art community turned out in a rush to see the opening of the Clyde Connell exhibit at Artspace. Some 400 people went through the doors at 710 Texas St, said Byron Gipson. Pam Atchison, SRAC director and canny observer of Artspace openings, noted, "Some art shows are for seeing and being seen; at this one people were enthralled by the art. I heard so many exclamations of 'That piece reminds me of ...' and other stories of life with Clyde." Atchison also pointed out the value of showing work by the descendents of Connell. "They've gotten the inspiration from Clyde but they each went in their own direction," she noted. Visitors to Artspace will see work by 2 great nephews, Dr. Pat Sewell and Dr. Bennett Sewell, granddaughter Carol Connell Shafton, great-grandson Anthony Colvin, son Bryan Connell and great niece Talbot Hopkins. Kids will also have activities to work on downstairs in imitation of Clyde's work, owing to education manager Tarama Davenport. Imagine some 120 pieces of art by Clyde Connell, who is both the Clementine Hunter and George Rodrigue of North Louisiana. 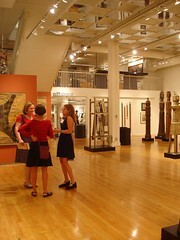 In the collection you will observe a life in art that spans 40 years - the 1950's to the 1990's. Therein you will see work reflecting the woods at Lake Bistineau, Louisiana. But it is art about Louisiana intended to communicate with the world. And especially with people in New York and Los Angeles. 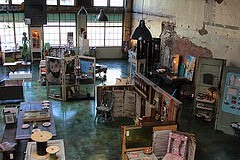 It may be the most NYC show you ever see at Artspace Shreveport. Clyde fell in love with Manhattan in the 1950's, when she attended annual meetings for the Southern Presbyterian Church. She explained that, somehow, "the churchniks introduced me to the beatniks." She learned to get around in Soho and hung out at MoMa. In Shreveport in the 1960's she painted and sculpted in a Cotton St. studio, At-the-Loft, alongside a group of equally obsessed Shreveport artists. Her cohorts included Lucille Reed, Janet Parker, Nevelyn Brown, Tama Nathan, Berk Borne, Lynn Gautier and Gwen Norsworthy. She had no money. She couldn't afford to ship her art to out-of-town shows. Couldn't afford to fabricate sculpture in metal. By the 1970s artists were submitting work to galleries and juries by slides. Murray Smithers of the Delahunty Gallery, Dallas, saw her slides. He came to Lake Bistineau for a look. He added Clyde to his Dallas roster. She was discovered by Texans. But getting into the top galleries in Dallas and Houston was not her end destination. 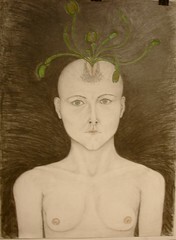 In 1981 the Delahunty arranged a solo show for Clyde at the Clocktower Gallery, Manhattan. She was finally able to gallery hop in Soho with an inner glow. In the 1980's Clyde was in her 80's - she was born in 1901. But she did not shrink from success. 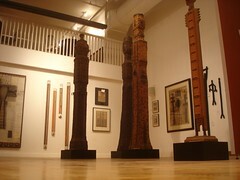 She won grants that paid assistants like John Fredericks, an art-minded neighbor, to help fabricate her towering totems. Her work was purchased by the Metropolitan Museum of Art and the Hirschorn Museum, Washington, DC. She was given awards and shows from coast to coast. 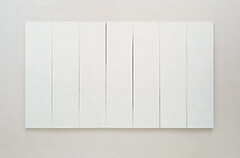 In 1990 she was featured in a major exhibit in Paris and Geneva presented by the Valois Gallery. At Artspace you will see the minimalist, abstract and primeval art she created on the shore of Lake Bistineau while dreaming of places far, far from here. From a NY Times review in 1992: "Miss Connell is at her best when she is at her most abstract. It is then that her synthesis of regional and non-Western culture, earlier 20th-century art movements and the crafts-intensive spirit of some of the feminist art of the 1970's become something very much her own. With these eclectic ingredients, a case might be made for the post-modern character of her work. Its strength, however, lies neither in calculated irony nor in borrowed styles, but rather in a sense of having been worked by a guileless, individualistic hand." This sort of recognition was not won easily or quickly. 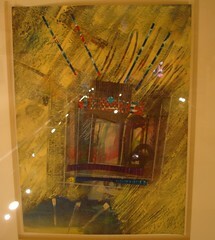 But when you see her art at Artspace you will sense how the story unfolded. You'll see her vision - both local and cosmic - in one vast body of determined work. Party at Artspace, 7 to 10 pm, with food, drink and music. Troubadour Kenny Bill Stinson will entertain. A Taste of Italy is a benefit for Shreveport Opera, says Sumer Cooner. You're invited to taste it on Fri, Sept 26, from 6:30 - 9 pm at the Bossier Civic Center. The bill of fare includes Italian cuisine, wine tasting, silent auction and music. Pie Works Pizza, Massi Products, Ernest’s Orleans Restaurant, Monjunis, Olive Street Bistro, Santa Maria Produce, Cush’s Grocery, Charles Ashley Catering, Notini’s, Starbucks, more. Original Signed Painting by Henry Goodrich, Jewelry from Stephen Miller, Interior Décor from Yarbrough Interior Designers and The Bungalow, Accessories from Sue Peyton’s and Knox Goodman’s, Autographed LSU and Dallas Cowboys Memorabilia, and more. River City Repertory Theatre announces registration and class schedules for its newly-formed, RCRT YOUTH!, says Patric McWilliams. 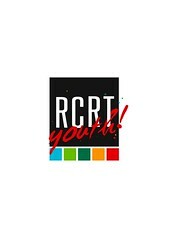 At RCRT YOUTH! students will get a chance to work with trained, professional acting teachers, inspiring guest artists and industry professionals each semester. An insight into the structure of having a professional career as an Equity actor will serve as a basis for instruction. RCRT YOUTH!’s first season will culminate with an evening of scenes and performances by its students. Future plans call for productions that will focus on theatre FOR children rather than theatre BY children. Acting classes, which begin September 16th, will be held at St. Paul’s Episcopal Church Fellowship Hall, 275 Southfield Road in Shreveport. Vocal classes will be held at the River City Repertory Theatre offices at 2829 Youree Drive, Suite 4, in Shreveport. The term ends November 22nd. Logan Sledge, a member of Actors’ Equity, will instruct 18 to 14 year olds. Trey Jackson, who is a veteran of local theatre, will teach 13 to 8 year olds. Seva May, one of the area’s most popular musical actresses, will provide vocal and musical performance instruction to all age groups. Sledge will also offer personal acting instruction to individuals by appointment. 8 & 9 yr. Tues.	5:00 p.m. to 6:00 p.m.
10 & 11 yr. Friday 5:00 p.m. to 6:00 p.m.
12 & 13 yr. Friday	6:00 p.m. to 7:00 p.m.
High School Acting Fundamentals Sec. A Tues. 4:00 p.m. to 5:00 p.m.
Sec. B	Friday 4:00 p.m. to 5:00 p.m.
High School Voice and Movement	Tues. 5:30 p.m. to 6:30 p.m.
"Watch out for the 'Potatoes... these folks are fun! Hailing from the Chicago area, this couple are pros to the core, and have a long list of endorsements," says Jim Huckabay at Fairfield Studios. The show is Sunday at 7 pm. "Eclecticism is defined as composition drawn from various elements and styles. May it be humbly suggested that this definition be simply shortened to Small Potatoes," writes Kevin McCarthy in a review of their album. "This Midwestern duo seamlessly hopscotches from one musical genre to another on their latest release. A Patsy Cline-sounding tune is followed by one bringing to mind Bob Wills or could it be Lyle Lovett? A cut with its genesis south of the border is preceded by a piece remindful of the 1930s music scene. Add a few ballad-like numbers, a splash of self-deprecating humor and dash of whimsy, plus some instrumentals and, voila, you have this Jacquie Manning and Rich Prezioso, aka Small Potatoes, offering. The title cut, "Waltz Of The Wallflowers," depicts two introverts warily attending a social function. Presenting the thoughts and fears whirling inside their heads, sometimes simultaneously, sometimes his line followed by her line, the pair eventually notices each other and finally end up on the dance floor to both their surprise and satisfaction." An encore production of “East Texas Hot Links,” a play written by Eugene Lee and directed by Robert Alford, will be presented in the LSUS Black Box Theatre September 12 - 14 at 8 p.m. The production also runs September 20 - 21 at 3 p.m. It will also be presented September 26 - 27 at 7:00p.m. in the LSUS University Theater, says Alford. The play, not recommended for youths, features seven returning actors: Sam Bailey, Nicki Daniels, Angela Harris, Billy Moore, Michael Matthews and Charles Montgomery; there are two new actors: Atonus Perry and Stanley Blackshire. “East Texas Hot Links” will be featured in the Southern Black Theater Festival in Shreveport. Tickets are $18 at the door or $15 in advance. Tickets for students, educators, senior citizens, military personnel or groups of more than 5 are $10. Advanced tickets can be purchased at www.ce.lsus.edu. For reservations or for more information call 318-797-5386. The Thurs Night Trolley has been wearing out Texas Street for these past 2 years. It is tried and proven. It is a classic. At Artspace there's entertainment, snacks, conversation and art. What's not to like? Then you hop on the TNT for a roundabout. The Municipal Auditorium is the antipode on this go-round. Donna…Service with a Smile, a visual art exhibition paying homage to the life of Donna Service, artist, educator, and co-founder of The Renzi Education & Art Center, will be held over at Columbia Café, located at the corner of Kings and Creswell. The reception will take place Sun, Sept 14, 7:30 - 9:30 p.m, says Ariej Alexander. To ensure Donna’s vision of a safe place for children to explore, learn and create under the guidance of professional teachers and artists remains a reality, these works are being auctioned to raise funds for the continuation of The Renzi Education & Art Center’s FREE 28-week art and academic based after-school program. Bid on the works Sun, Sept 14, through Fri, Oct 3. 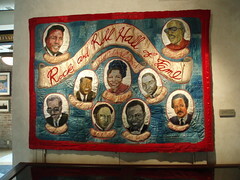 Artists include Donna Service, David Nelson, Melody Kiper, Walter Washington, Bob Ward, Allison Dickson, Chris Broussard, Serena Sherriff, Frances Drew, Dan Garner, and many more. 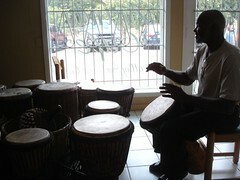 Ariej Alexander: aalexander@renzicenter.org or call 318-222-1414. Barnwell Center's Freda Powell has sent a call to artists for a show called "White on White, a winter season juried exhibition of the many hues and shades of white." Deadline for submissions is Nov 7. The show will open Dec 5 and be on view until the end of the year. The Harmon Drew Supergroup has a vast personnel which always seems to include comely women in slit skirts. Something for everyone. 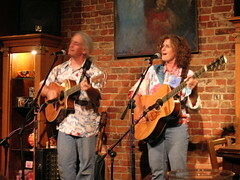 Catch them at Jayne Marie on Fri, 7 to 11 pm, says Bruce Flett. He notes that "Since Harmon was unopposed for re-election to the State Appeals Court, they certainly have something to celebrate! Definitely one of the most admired persons in our area (he lives in Minden), Harmon Drew, Jr, or is he the 3rd?" 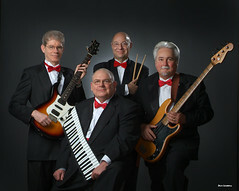 The nucleus: guitarist Don Hyams, keyboardist Harmon Drew, drummer Sammy Nix and bassist James Wagley. Mary Thoma workshops for actors announces a last-minute young actors workshop for those aged 10 to 17. It will be 9 am to 2 pm at East Bank Theater. It features Mary Thoma, actress, director and actor’s workshop leader, says Thoma. Out of school with nothing to do tomorrow? Want to brush up on your acting skills, play some improvisation games and work on some scene work and monologues? Have an audition for school or film? This last minute workshop can be tailored to suit the participant’s needs. Grab your umbrella and meet me at East Bank Theater! Space is limited. Email or call now. Bring a sack lunch and drink; there will be a 30 minute lunch break. * 10% of your payment will be donated to the American Red Cross to help evacuees of Hurricane Gustav. mmatters3@bellsouth.net or call (318) 465-5374. Payment may be made on site by check or cash only upon arrival. While he teaches and paints in Shreveport, abstract artist Bill Gingles sells his work in Chicago, San Antonio and Covington / Baton Rouge. Shreveport Blog editor Robert Trudeau listens as Gingles offers a brief exploration of his background and philosophy of art. Developing artists eager for more such insight might consider The Business of Art, a 9 to 5 pm workshop at Robinson Film Center produced by Jane Allison of the LSU Small Business Dev Center. It will be presented Sat, Sept 13. The conference features national speakers and lunch and costs $35 ($25 in advance). Register at 318-797-5144. See more detail in a previous blog post, please.